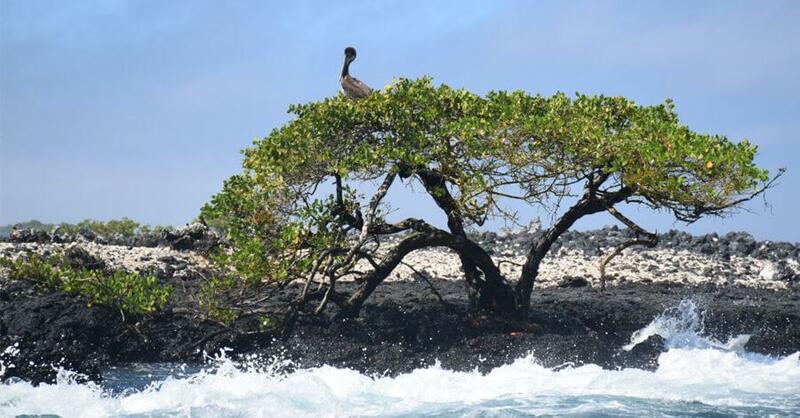 The Galapagos Islands are home to a unique ecosystem that hasn’t changed for thousands of years. Known as the birthplace of evolution for many thanks to its symbolic Darwin finches, swimming iguanas, flightless cormorants and many many more species. The Galapagos Islands are about 2000 miles from mainland Ecuador, so you have to either fly or go by boat. We would recommend flying if you don’t feel like spending 4 weeks on a ship. Operators that fly from Quito and Guayaquil are Tame Airlines, Avianca or Lan. Once you arrive in Galapagos, you will have to pay a $100 entry fee which goes towards the maintenance of the park and its park keepers. Make sure to have this in cash, as you pay in the airport. Most flights land on the Baltra airport, although there is also a small airport on San Cristobal, but these flights are sometimes more expensive. Baltra is a short distance away from Santa Cruz, where you can stay in Puerto Ayora. 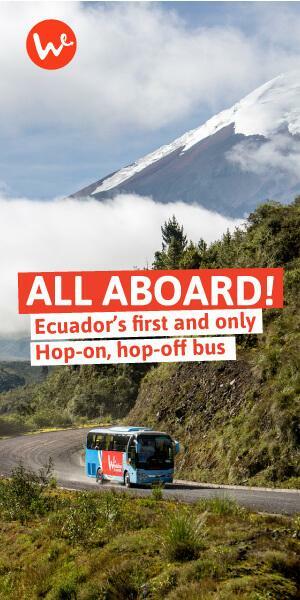 A shuttle bus takes you from the airport to the ferry, from where you can cross to Santa Cruz. There are three main areas you can stay in: Puerto Ayora, Isla Isabela, and Puerto Baquerizo Moreno (on San Cristobal island). We recommend staying in more than one, to take advantage of the attractions closest to each one. After landing in Baltra take the free shuttle to the ferry, then hop on a boat to Santa Cruz. This is a perfect starting point for you visit to the Galapagos Islands. When you arrive, you could either head to your hotel to drop off your things, or take advantage of your location and take a taxi straight to Los Gemelos – a group of massive volcanic sinkholes half way between the ferry crossing and Puerto Ayora. Expect to pay between US$10-15, which includes the driver waiting for you while you explore the craters. Once you get to Puerto Ayora, go to book your trips for the next day or two, as most of these need to be arranged in advance. Within Puerto Ayora you are a short walk away from Tortuga Bay and the famous Charles Darwin Station, two must-see spots in the Galapagos Islands. Day-trip snorkeling in Santa Fe. A small island to the south east of Santa Cruz, Santa Fe provides the opportunity to see some amazing sea creatures, such as sea lions, stingrays, sharks and turtles. You can also see iguanas and blue-footed boobies on land here. If you book from a tour agency in Santa Cruz it will usually cost between $80-$100 and includes wetsuits, snorkeling gear and lunch. The wetsuit part is really important, as the water can be really chilly, but totally worth the shivers! Option 1: If you are a diver, then North Seymour Island is definitely worth a visit. This dive site is famous for Hammerheads, reef sharks and the Galapagos shark. A 2-dive tour usually costs between $120-$140 and a 3-dive tour around $170. As diving expeditions are pricier than most, we’ve included another option for the day if you’re on a tight budget or don’t fancy diving. Option 2: Get a boat to Puerto Baquerizo on San Cristobal Island, this will take about two and a half hours. The public ferry sets off at about 7 from Puerto Ayora and arrives at about 9:30 in Puerto Baquerizo Moreno, giving you all day to explore the island! We recommend booking your trip for the following day and having a relaxing lunch. If you went to North Seymour yesterday, get the boat to Isla Isabela at 7:00am. Once in Isla Isabela you can book a half-day hike to Sierra Negra, which usually costs around $30 per person. The Sierra Negra is an amazing volcanic landscape in the center of Isla Isabela Island. Stay overnight in Isla Isabela, enjoying the attractions and walks surrounding Puerto Villamil. For a nice walk, ask for the Manglares or mangrove trees. If you are in Puerto Baquerizo, head out on a day-trip to Kicker Rock, one of the most biodiverse places in the Galapagos Islands (make sure you book the night before). You will usually depart at about 7:30 am, as the trip to the island takes about 1h30. Most tours include snorkelling at Kicker Rock, where you can see baby sharks, hammerheads, Galapagos shark and blacktip shark. Then a packed lunch and a visit to a deserted beach on the North side of the island before returning to Puerto Baquerizo. Get the ferry back to Santa Cruz (the first is at 7:00 am), pick up some souvenirs in Puerto Ayora, and get a taxi to the airport. We hope you enjoy the Galapagos Islands! What’s next? Keep exploring Ecuador, one of the most diverse and beautiful countries in the world. 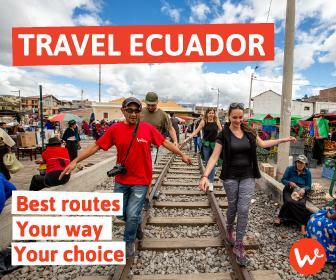 Here are our suggestions: relax and party in Montañita; visit one of the most impressive volcanoes in the world; or do some extreme activities in Baños, Tungurahua.